Found ID - What do you have to lose? What is Found ID All About? We all lose stuff. We all find stuff. At Found ID, we help you get it back. That's it in a nutshell. We all know how it feels to lose something important and we've all found something we thought was important to someone else. 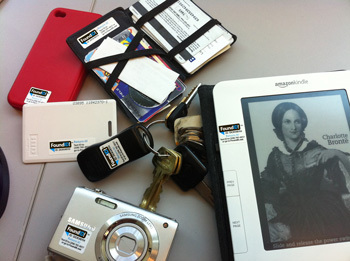 So we started Found ID, a tech-based lost-and-found service that connects the person who finds the misplaced item with our Found ID members instantly. It's perfect for anything that's easily lost but hard to replace, like phones and laptops, keys and cameras, backpacks and notebooks (how clutch is a math notebook the night before a test?) jackets, even tennis rackets. The best part is Found ID keeps your private information private. It’s a simple way to let people know, "Hey! This item matters to me!" and makes it super easy for someone to help get your stuff back to you. When you sign up for an account, we'll send you labels/stickers with your unique Found ID. (You only need to register once; the ID is yours for life.) Then, if you ever lose something with your Found ID in a taxi, on a trail, in a restaurant (you get the idea), Finders have an easy, quick way to return it and be your hero for the day. (Click here to find out How It Works.) Plus, All your personal information is kept absolutely private and your name and contact info never appear on your stuff. For organizations who want to give their members or clientele a value-added perk, we offer a white-labeling program that boasts their branding, but the same Found ID functionality. Kids, adults, the super-organized, the somewhat scattered all misplace something from time to time. Our Founder, an economics professor, created Found ID to help his girls keep track of, well, everything. (He still misses his favorite fishing pole that went missing back in the 80s.) The final straw was when his youngest left her photography portfolio in the back of a cab. Her entire creative work life, vanished without a trace. He wanted to be able to identify the stuff that meant the most to them - the things that got them through each day and the items with huge emotional attachments. But he also wanted to protect their identity, so he modernized the old-fashioned nametag.